Chaz Davies (Aruba.it Racing - Ducati) and Jonathan Rea (Kawasaki Racing Team) battled it out for supremacy in race one at Motorland Aragon, until Davies crashed out on the entrance to the final corner of the penultimate lap. 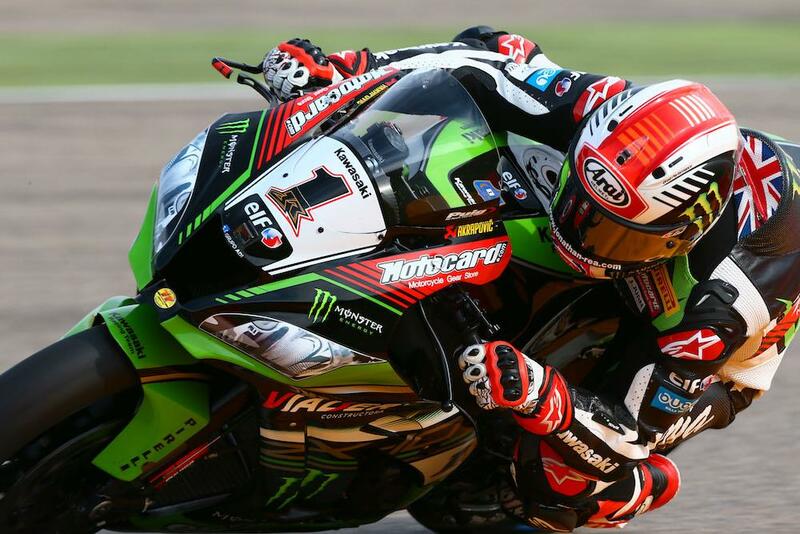 Rea therefore won his fifth race in succession. Behind the leading dramas and frequent attempted passes, what looked like a long-game plan from Tom Sykes (Kawasaki Racing Team) did not pan out, as Marco Melandri (Aruba.it Racing - Ducati) made enough of a break at mid-race for Sykes to have to drop back to finish an eventual third, not helped by a bout of illness that developed overnight. 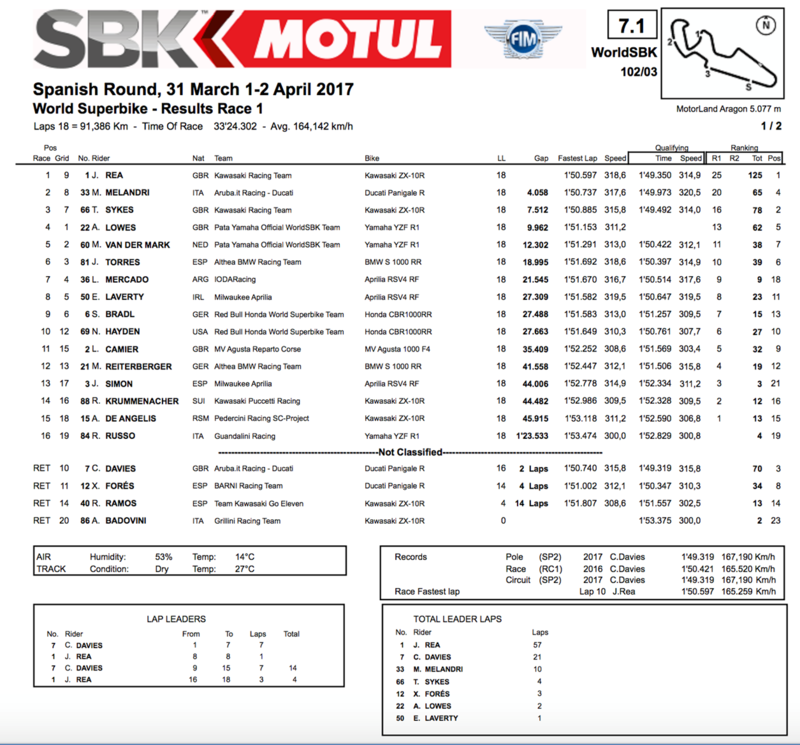 Alex Lowes (Pata Yamaha Official WorldSBK Team) got the better of Michael van der Mark (Pata Yamaha Official WorldSBK Team) to score fourth place, with the top six completed by advancing local rider Jordi Torres (Althea BMW Racing Team). A great first race for his new team gave Leandro Mercado (IodaRacing Team Aprilia) seventh, some six seconds ahead of the factory supported RSV-4 of Eugene Laverty (Milwaukee Aprilia). Laverty got the better of the two works Honda riders, with Stefan Bradl (Red Bull Honda World Superbike Team) just behind in ninth and Nicky Hayden (Red Bull Honda World Superbike Team) tenth. Leon Camier (MV Agusta Reparto Corse) was 11th and Markus Reiterberger (Althea BMW Racing Team) 12th. Xavi Fores (Barni Racing Ducati) looked set for a top five finish until he crashed out after a handful of laps. He got going again but his bike eventually caught fire and he had to jump off after leaving the track surface, his bike a blazing wreck in the run-off area.